Chicago (36-34-12) needed one point to go OVER its season points total of 84.5 at the Westgate SuperBook, but couldn't do it. Brendan Perlini and Drake Caggiula scored for the Blackhawks, who lost three of their last five. 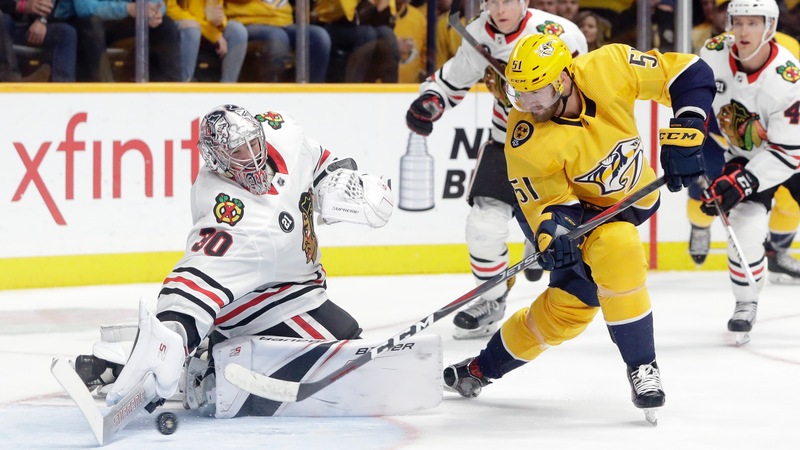 NASHVILLE, Tenn. (AP) -- Viktor Arvidsson scored the go-ahead goal at 3:33 of the third period, and the Predators won their second straight Central Division title by rallying from an 0-2 deficit to beat the Blackhawks 5-2 Saturday night. With St. Louis beating Vancouver 3-2 earlier Saturday, the Predators needed two points against Chicago to win the Central or risk going from division champs to possibly third if Winnipeg finished off with a win at Arizona later. The Predators now are assured of home-ice advantage through at least the first two rounds of the playoffs. Chicago (36-34-12) needed one point to [go OVER its season points total](https://www.betchicago.com/nhl-points-total-update-blackhawks-over-under) of 84.5 at the Westgate SuperBook, but couldn't do it. Brendan Perlini and Drake Caggiula scored for the Blackhawks, who lost three of their last five. The Predators struggled mightily when allowing the first goal all season, but they’ve have rallied from two-goal deficits in each of their past two games. __MORE:__ [Blackhawks season review](https://www.betchicago.com/blackhawks-2018-2019-season-review) Arvidsson set the franchise record with his 34th goal of the season 22 seconds into the man advantage. His wrister from the left circle beat goalie Cam Ward glove-side and gave Nashville its first lead of the game, which Arvidsson celebrated by jumping in the air behind the net. Filip Forsberg and Nick Bonino each had a goal and had an assist, and Dante Fabbro scored his first NHL goal for Nashville, which now has won five of six. Colton Sissons added an empty-netter with 2:09 left. Pekka Rinne made 31 saves to finish 30-19-4, his eighth season with at least 30 wins. Nashville hadn’t won at home on a Saturday night since Dec. 15, and the Predators’ last home win in regulation on a Saturday night was Dec. 1 in a 5-2 win over Chicago when they scored three goals on their first four shots. This time it was the Blackhawks scoring on their first shot with Perlini’s wrister from the left circle beating Rinne’s glove at 2:58 of the first period. Artem Anisimov hit a post at 5:00, then Caggiula made it 2-0 Chicago with a wrister off an assist from Patrick Kane midway through the period. Fabbro, who joined the Predators last week after wrapping up his junior year at Boston University, pulled the Predators to 1-0 with the first goal of his career at 9:07 of the second. Fabbro’s wrister from the left circle went over Ward’s glove. Then Ward made another big save, coming out to stop a partial breakaway by Arvidsson 90 seconds later. Seconds after a power play ended, Forsberg tied it up with a slap shot for his 28th this season with 1:10 left in the second. Nashville put it away with three goals in the third. Bonino’s goal came inside the final minute with the celebration already well under way. NOTES: Nashville improved to 5-8-1 when tied after two periods. ... Rinne tied Miikka Kiprusoff (623) for second-most all-time in games played by a goalie from Finland. ... Nashville is 12-25-5 when allowing the first goal and 9-19-2 when trailing after one period. __PLAY:__ Our [free daily contests](https://betchicago.chalkline.com) for the chance to win a BetChicago prize pack.